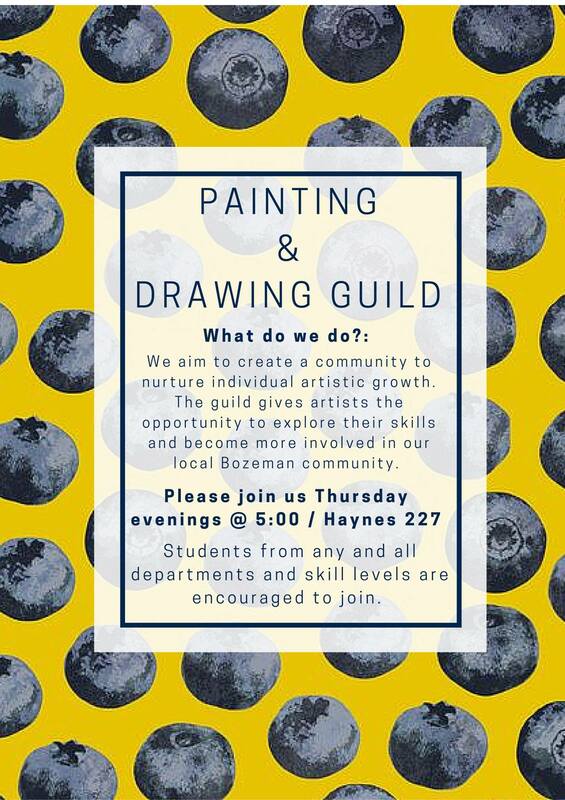 Due to student engagement, the Painting and Drawing Guild at Montana State University has been reestablished after a semester hiatus. Sophomores Elise Perpignano and Julia Dobie are heading the newly inspired formation of the guild, which “aims to create a community to nurture individual artistic growth,” according to their meeting fliers. The guild wants to “give artists a chance to display their work and offer a supportive environment so that (students) can embrace (their) creativity,” said Perpignano. The guild, which meets Thursdays at 5 p.m. in Haynes Hall room 227, is often informal with Dobie baking cookies for the 10 current members. The club is open to anyone with an interest in painting and drawing, not just those with a major focused in art. Among other benefits, membership provides individuals instant feedback on pieces created either at home or with the guild. In the past, members have put on events such as pop-up galleries and live drawing classes in order to improve their skills and promote their art. “People should join because it’s a great opportunity to network with other creative thinkers, get involved in the community, and therefore make even more connections. Not to mention the chances to showcase their art,” says Dobie. The Painting and Drawing Guild are trying to be active in the community of Bozeman. They participated in the Bozeman Winter Market at the Emerson this past weekend. Handmade Valentine’s, created by members, were sold as a fundraiser for future events. Perpignano encourages community members to “keep your eyes out for our art” as the guild grows.